Worn once. Has been dry cleaned at Regal Dry Cleaning. Has been altered to my height (around 163cm). Size 8. Has padding in top which can be removed easily. SIMPLY CLASSIC WEDDING DRESS Truly minimalist, this simply classic wedding dress is sophisticated and elegant. A contemporary fit and flare silhouette hugs the figure to below the hip, then billows into a fully flared, opulent skirt. 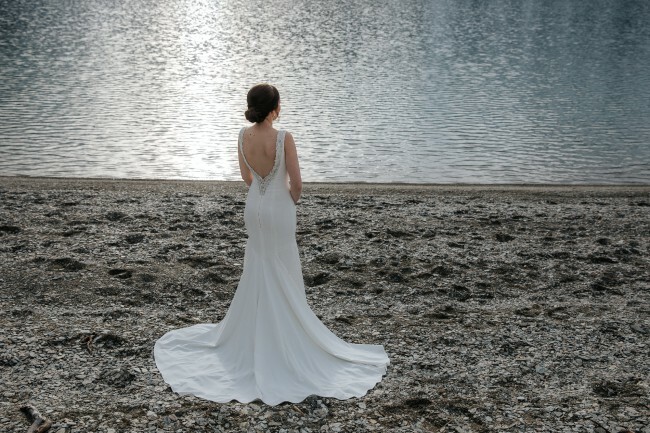 Exquisite hand-beading, finely detailed, decorates the low back, shoulders and trails into the front neckline.